Transmacro Amenities’ new and stylish Fresh Choice soap and amenities collection embodies the essence of the millennial generation and those that are young at heart. Special, confident, upbeat and conventional. This unique formula contains soothing ingredients and a fresh and bold fragrance that will remind your customers of a high-end spa experience. Packaging plays a major role in the appeal of any soap and amenity collection. The clean, crisp and contemporary design of Fresh Choice’s packaging showcases a minimalist and contemporary design. This unique and contemporary design will enhance the appearance and appeal of this collection. 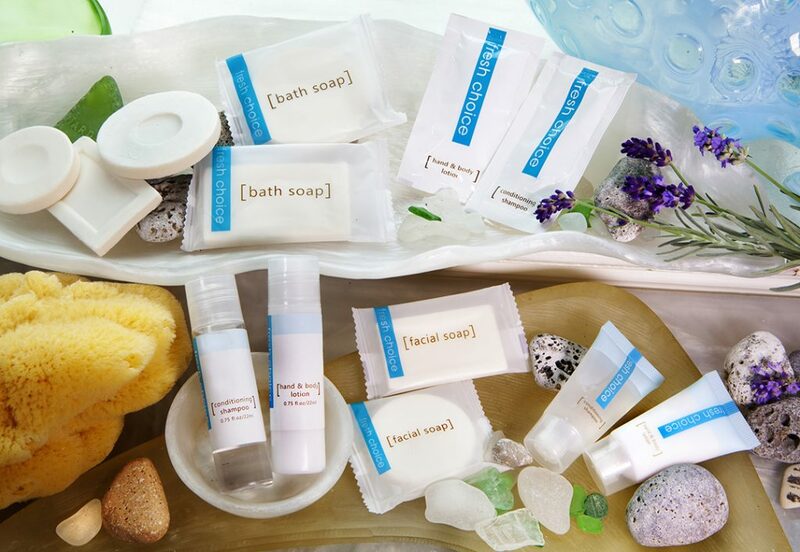 Transmacro Amenities’ brand new Fresh Choice soap and amenities collection is a distinguished amenity choice indeed. This is a product line your customers will proudly place in their guestrooms time and time again. With Fresh Choice’s more affordable price point get fresh and procure your amenity requirements today. For an exhilarating experience that will leave your customers refreshed, hydrated and replenished, use Fresh Choice bar soap. This soap offers a mild and gentle experience that will keep your customers coming back for more. Ah, the simple pleasures of Fresh Choice shampoo and conditioner! Who doesn’t love hair that feels clean, smells clean and shines with radiance? This gentle formula with a highly intoxicating fragrance will remind customers of a high-end salon treatment. Fresh Choice Lotion provides much-needed moisture and protection for your customer’s skin care needs. Customers will notice the silkiness and lightness of this wonderful new product.